The Pirates lost a couple of outfield prospects in 1990, but they still had others in the pipeline, Pirates assistant GM Cam Bonifay told The Pittsburgh Post-Gazette the next April. Bonifay named five, among them, Domingo Merejo, according to The Post-Gazette. "They're all at the high A level, maybe Double A," Bonifay told The Post-Gazette. 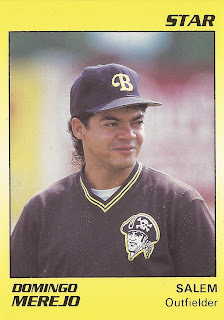 Though Bonifay mentioned Merejo, a veteran of five minor league seasons with the Pirates, Merejo didn't play at all that year, or again. He made AA, but didn't make the majors. Merejo's career began in 1986, signed by the Pirates out of his native Dominican Republic. He started in the rookie Gulf Coast League. He it .190 in 40 games. He moved to short-season Watertown for 1987 and played there again in 1988. In 67 games there in 1988, Merejo hit .249, with nine home runs. He also stole 16 bases. He hit a two-run home run in a July game. Merejo made single-A Salem in 1989. He hit two home runs in an April game. He hit another home run in a July win. Overall, he hit .242 in 118 games, with 11 home runs. His final season came in 1990 at high-A Salem and AA Harrisburg. He hit .231 in 36 games at Harrisburg and .283 in 82 games at Salem to end his career.